RB-Marlon Mack-Can he be a lead back? There are hundreds of stories being told during the planning and anticipation of the 2017 NFL Draft. 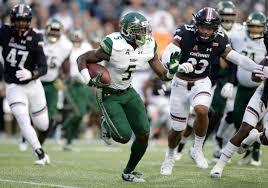 Today we will be looking at a scouting report for junior running back Marlon Mack, USF Bulls. RB- Marlon Mack, USF 6’ 210 lbs. Cons: The first concern with tall lanky backs is they run too high (which limits their power) and allow defenders into their body too much. By not running behind his pads which leads to being off balance, he is easier to bring down, especially with arm tackles near the line of scrimmage. Mack has missed a game in the past two seasons due to a concussion or hamstring injury. The former Bull has some ball security issues that rears its ugly head whenever he fully extends near the goal line or for a first down. He breaks the majority of his plays outside, trying to outrun defenders instead of dealing with them head on. Going outside against AAC competition is one thing, but trying it against NFL players is another. In the passing game, Mack uses his body to secure most targets and despite his speed has issues tracking the ball over his shoulder on wheel routes. The back gets off-balance when he tries to pass or run block and shows little effort in attempting either. I thought his vision was only adequate. Pros: The runner has bouncy, quick feet with loose hips that allows him to change directions on a dime. He has a nice jump cut that he uses with spins, stiff-arms, and shoulder shakes. Mack can knife through a sliver on the line of scrimmage and find the cut back lane. This back has a smooth glide that allows him slip past defenders if they don’t grab a hold of him. The former Bull is quite good at making the first man miss in space and burst into his second and sometimes third gear down the field. Overall impressions: Mack reminds me quite a bit of former Titans back Chris Brown who had a thousand yard season in 2004, but who took too many hits in the NFL. Brown then fumbled his way out of the league a few seasons later. His explosion is amazing, but his lack of ball security gives me pause. I like Mack’s value towards the end of the second round or early third round in rookie drafts. « EDGE-Tim Williams-Skills check! Character ?